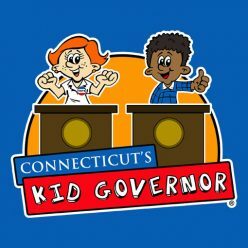 The third annual Connecticut’s Kid Governor® Inauguration Day event took place in the historic Courtroom at Connecticut’s Old State House on Friday, January 19th. Nearly 300 students, educators, elected officials, and members of the press attended the celebration. The day began with 2017 Connecticut’s Kid Governor Jessica Brocksom sharing her Responsible Pet Ownership video with the classes in attendance. Megan Kasperowski was sworn in as the third Connecticut’s Kid Governor by Secretary of the State Denise Merrill. The ceremony was followed by a press conference featuring 2018 CTKG Megan and five of the six final candidates. The final candidates and their classes attended the event which included an immersive exploration of Connecticut’s three branches of government in the rooms where they happened. Students were welcomed by Old State House staff and volunteers as well volunteers from Civics First. On February 7, 2018, CTKG Megan was recognized by Senator Art Linares on the Senate floor during Opening Day. Following a visit to the Senate chamber, Megan met with Governor Dannel P. Malloy, interviewed Lieutenant Governor Nancy Wyman, and met with her state representative, Christie Carpino. You can read about Megan’s Opening Day experience here. You can read CTKG Megan’s interview with Lt. Governor Wyman here. In an effort to learn more about how students can help those with cancer, CTKG Megan interviewed fellow Portland native, Brian Willinsky. Willinsky fundraises for the Dana Farber Cancer Institute in Boston. You can read about Megan’s interview in here own words here. In May 2018, CTKG Megan announced her Stronger Than Cancer Fundraiser. One of Megan’s platform goals is to lift the spirits of cancer patients by providing entertainers who can visit them in hospitals here in Connecticut. CTKG Megan set a goal of $1,000 to hire entertainers to cheer up patients at Connecticut Children’s Medical Center in Hartford and Smilow Cancer Hospital in New Haven. Megan invited schools across Connecticut to hold a fundraiser to support her statewide campaign. Schools were encouraged to hold a “Stronger Than Cancer Hat Day” on Friday, May 18, 2018. Students or teachers who donated $1 would be able to wear a hat and would receive an official Stronger Than Caner wristband in June. Thank to the support of Connecticut’s students at schools across the state and online donors, CTKG Megan exceeded her goal and raised more than $3,500! Proceeds will be split between Connecticut Children’s Hospital and Smilow Cancer Hospital with additional funds going towards cancer research. CTKG Megan Goes to Washington! Megan met with Senator Richard Blumenthal, Representative Rosa Delauro, and staff from Senator Chris Murphy and Representative John Larson’s offices. She talked to the legislators about her platform and about the Childhood Cancer STAR Act. While in Washington D.C., Megan toured the National Institutes of Health and learned about the research they are dong to cure cancer. On August 23rd, CTKG Megan was recognized as the G.O.A.T. of the Game at the Hartford Yard Goat’s Strike Out Cancer Night. The Yard Goats and Jefferson Radiology named 70 GOATs during the 2018 Season to help celebrate the strength of those who have fought cancer and won and those still fighting. 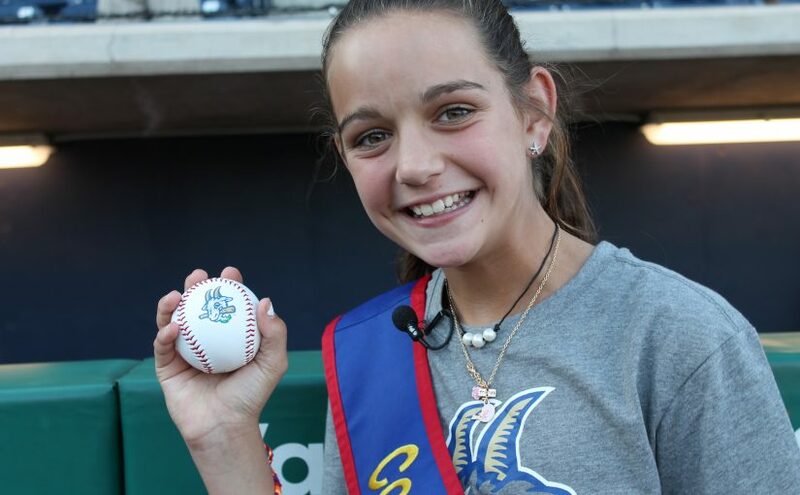 CTKG Megan was recognized on the field before throwing out a ceremonial first pitch before the game. During CTKG Megan’s term, students and community members across the state worked to make her Stronger Than Cancer fundraiser a success. In schools, students held Hat Day Fundraisers to support Megan’s original $1,000 goal. Community members made online donations and, along with students, surpassed Megan’s second goal of $3,000. In all, CTKG Megan raised more than $4,300 to help hire entertainers to lift the spirits of cancer patients. During the fall, Megan was able to donate $1,250 each to Connecticut Children’s Medical Center in Hartford and Yale New Haven Children’s Hospital in New Haven. The remaining money will be donated to help support cancer research.